The Louvre is the world’s most visited museum and one of the world’s largest. It has about 652,300 square feet of exhibition space, 5 floors and 17 wings, with over 380,000 objects and displays 35,000 works of art. After the French Revolution in 1795, when the Louvre officially opened its doors to the public for the first time, artists were given priority for admission over the general public who were admitted on weekends only. 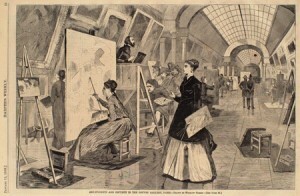 In more recent times, Renoir, Henri Matisse, Degas and countless other artists studied and drew from its master works. Today, it still welcomes artists. Anyone can draw there with few restrictions, you can bring your own small stool and draw on paper up to about A2 size. I draw there as much as I can while I am in Paris. 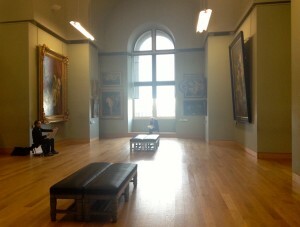 Many of the studies of sculptures on this site were drawn in the Richelieu Wing from the sculptures in the Cour Puget. The Louvre is huge. There are always places where you can find a quiet corner to draw. However, if you wish to paint you need to get special permission. Many people do, as for five-days-a-week, from 9.30am to 1.30pm, painters study master works using one of the historic easels and stools provided for you. But only 150 copyists are allowed in the Louvre at a time, and there is at least a one-year waiting list for the privilege. Before starting work, each canvas is permanently identified to try and stop the finished version being considered an original, and it must not be the same size as the original. To see some of my studies from the Louvre, please look here.